If this new year were the last year of your life, what would you do? Would you quit your job? Would you launch yourself on some grand adventure, sailing around the world or hiking the Pacific Crest Trail or climbing Mount Kilimanjaro? Would you start some passionate love affair? Would you play the musical instrument you wish you had always mastered? If this new year were the last year of life for someone you love, what would you do? Would you help them realize a lifelong dream? Would you tell them everything you’ve held back, good and bad? Would you spend the time in anger and fear, resentful of the shortened time together or would you spend the time by giving love, helping to create the best day possible? In Atul Gawande’s book, Being Mortal, he shares some research by Laura Carstensen about perspective. How we choose to spend our time depends on how much time we think we have. When you think you have decades, it’s easier to delay gratification and plug away, grind away, at daily life. But when you only have a short period of time, your focus shifts to right here, right now, and being with the people you love. This was the refrain my father muttered over and over again as we sifted through the chores left for those who remain after a loved one dies. He meant it in reference to the chores. We were woefully unproductive. But it resonated more deeply. The day is over. The vacation is over. The year is over and a new one has begun. Time feels precious and short. The face in the mirror looks older, both sadder and calmer. Old enough to know that new year’s resolutions just lead to guilt and anxiety and self-hatred. Old enough to know that time is passing and life is short. Old enough to know that changing habits is hard, but a few strategic goals and intentions can be a guiding light, a focus for incremental change and constructive personal growth. So this year I will try. I will try to live each day as if it were a precious gift, one that I might not get tomorrow. I will tell the people that I love that I love them. I will try to create the best day possible, whatever that means, because it changes every day. And since I tend not to be spontaneous nor impulsive (and I have a mortgage), I won’t be quitting my job or launching myself on a grand adventure (at least probably not, or not right now). I will keep moving deeper into the activities I find meaningful and speaking with honesty to the people I love. I will look people in the eye – and smile – and say the words that facilitate connection: Please, Thank You, I Love You – so grateful for my friends and family and so aware of how much I need them and how much they help me. Of course, I will fail. 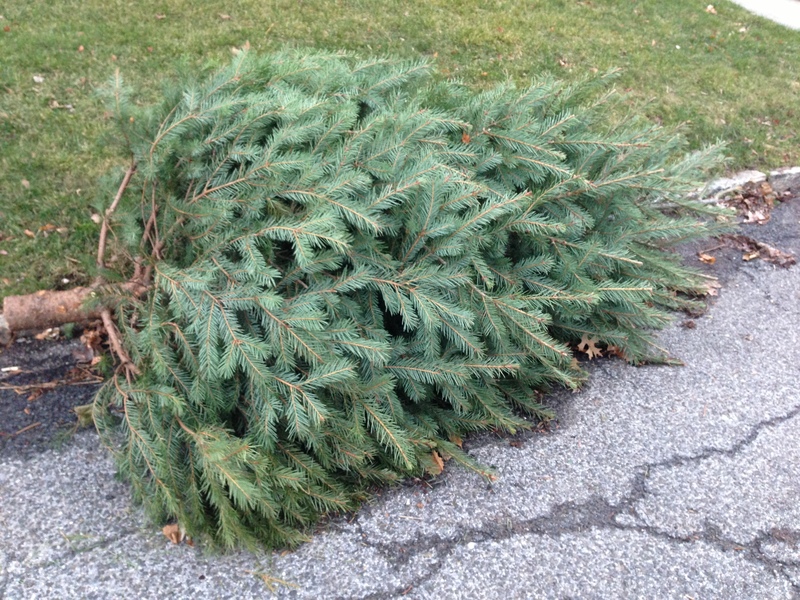 I will look at the Christmas tree forlornly on the street, feeling sad that I am sad. I will be anxious about returning to work. I will be annoyed at the annoying people on the train. I will begin missing my daughter even though she hasn’t left for school yet. I will be jealous and angry at all the people who seem to manage life with more grace and ease than me. And then I will remember to try. To do something different. Because my anxiety and sadness are habits. And that everyone struggles with their challenges, their demons. And then I will reflect on the last year, with pride and gratitude, and remember that I haven’t quite mastered last year’s goal yet, to choose laughter. So, I’ll just keep trying. I have a friend our age here who has been through treatment for pancreatic cancer and is in remission…He spoke at the first Relay for Life fundraiser our high school held which has stayed with me, which is that he no longer just shakes hands. When he greets people now, it’s always with his giant bear hugs. There isn’t time to be formal and distant–time IS passing….To love and be loved at every opportunity is his way now, and I hope you will find similarly; as you love even more deliberately than you already do, if that’s even possible, that it will come back to you a hundred-fold. I remember the joke exchanges at the beginning of last year…lol. Here’s love to you as you make your way in the wake of a very challenging year. Well, I have heard inspirational speeches, and try to take what I’ve learned to heart. But, it really became more important than ever to me with this last back injury. So many surgeries and procedures in the past, and each one takjng their toll on my body made me fearful for the last surgery which was a 6 hour back surgery. I was quite nervous that I may not wake up, and decided to stop being so strict and regimented with the kids and jyst love my friends and family for them. So what they don’t put their dishes in the dishwasher or see the messes in MY kitchen they should have cleaned. I gladly do that and am just happy to be part of their lives; teaching them to drive, being there during heartbreaks (Marcus lost a friend at the end of his senior year -young man was hit by a car crossing the street), and just loving them. I have been through things in my life no child should go through, but I have learned that these things have made me the strong woman I am today. Yes, I’m still a little shy, but realize that I am not nothing and do have intelligence. So, my friend, I love you dearly, and you CAN find the laughter. You are a bright, intelligent, loving, caring, strong woman. Time is passing, but you are on the right track on how to cherish and enjoy each day. Do NOT let anybody steal your joy! Remember, you cannot control how others act or react, only how you will react to them and their annoying or upsetting situations. Don’t allow somebody’s bad day become yours. I love you, and pray you find the laughter and peace, love, and less anxious times. Thank you John, for always reading, always appreciating. Happy New Year Sally! Looking forward to more adventures!